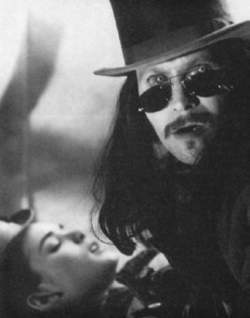 Gary Oldman (with Winona Ryder) as Dracula in Bram Stoker’s Dracula. Gary Oldman, the actor who portrayed the title role in Francis Ford Coppola‘s production of Bram Stoker’s Dracula, was born in London, England. His dramatic career began at age 17 when he applied for a position at a theatre near his home. After hearing him read a passage from Shakespeare, the theatre’s director assumed a mentor’s role for Oldman. Once he broke into movies, Oldman quickly became known within the professional community for his ability and the wide range of characters he portrayed. He played Sid Vicious in Sid and Nancy; Joe Orton in Prick Up Your Ears; and Lee Harvey Oswald in Oliver Stone’s JFK. The role of Dracula allowed Oldman to show the broad range of his acting abilities, as he had to portray the variant personas into which Dracula transformed. He was first Prince Vlad the Impaler, the young warrior who won the war but, in a nasty twist of fate, lost his love. He was then the aged nobleman, the undead ruler of Castle Dracula. Once in England, Dracula’s animal persona came to the fore, first as a monstrous wolflike creature (harking back to the identification of vampires and werewolves in Slavic folklore) that attacked Lucy Westenra, then as a batlike creature that opposed the men united against him. Meanwhile, he periodically reappeared as the handsome young suitor of Mina Murray that vied for her love until she married Jonathan Harker. The very nature of the part prevented Oldman from being typecast in the role. Since Bram Stoker’s Dracula, Old-man has remained active starring or co-starring in two to three movies annually. Rohrer, Trish Deitch. “Gary Oldman.” Entertainment Weekly No. 145 (November 20, 1992): 32–34. answers Seymour Jane 10 Oldman, Gary 9 manger, A8 Tynemouth's, 7 Aerial, 6 Holmfirth, 5 1988, 4 Nine, 3 Crete, 2 dormouse, The 1 questions: 10 Elliott.